Harry pointed out in his blog post the other day that the latest update now provides a warning to let us know when we are opening an older file that must be upgraded first. It gives us an opportunity to cancel the process. 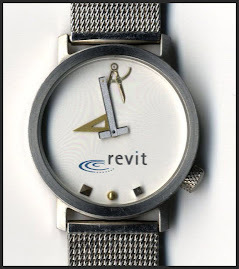 As you are well aware, we've always had to wait for that to finish before we could close the file, WITHOUT saving, and then open the correct version of Revit, and begin again. 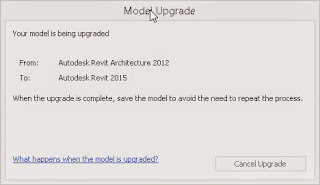 I complained about this in my own blog post and Harry was good enough to respond with a solution via his Boost Your BIM site and his excellent Udemy Revit Programming class. 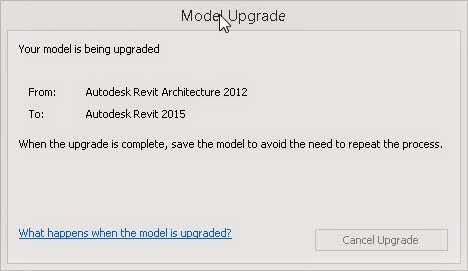 However, unlike Harry's solution, which stops Revit in its tracks until I provide a response to the warning, Autodesk chose to let Revit keep opening the file. The dialog stays on screen until the file finishes opening. When we are opening a project file that's probably okay-ish. Opening a family file, not so much. They will usually open too fast to make it of any use (ironic that is a complaint of sorts). I tried it on a couple families prior to writing this (and the reason I'm writing now) and I saw the dialog exactly long enough for me to grasp what it was saying and it was gone...too late to click Cancel Upgrade. Unless I'm poised to click the button as soon as I start to open a file I'm likely to miss it. Sadly it is a bit too much like Whack a mole, the bugger's gone before my mallet gets there.